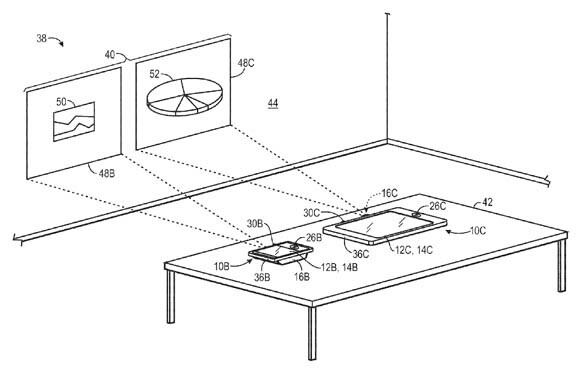 Apple has filed a patent application for an entirely new type of user interface that combines pico projectors, inter-device communications, and gesture recognition. The filing, "Projected display shared workspaces", envisions users interacting with displays projected by pico projector–equipped devices such as iPhones and iPads, or accessory projectors attached to laptops or desktops. The filing notes that today's devices make screen-sharing easy. "However," it notes, "to facilitate portability, these display screens may be small, which may inhibit viewing by larger groups of people. Further, to facilitate viewing on the display screen, the electronic device may be transferred between viewers, which may be inconvenient." That explains the projectors, which the filing states could be of many types: holographic laser, LCD, DLP, liquid crystal on silicon (LCOS), or LED, "among others". The filing, however, goes beyond mere projection to describe a user interface that takes advantage of communication among the devices, either peer-to-peer or through an intermediary server. Multiple projected displays would thus be aware of one another, and users could move objects among the displays using hand gestures – or the shadows of gestures – that would be detected by the devices' cameras. Alternatively, users could move objects among displays by manipulating those object's icons on, say, their iPhone displays. Sharing permissions could be set up by users or administrators, and file and communication encryption would also be provided. The items moved from one display to another wouldn't necessarily need to be resident on the devices themselves – the filing lists as further sources streamed image data or image data captured live by the devices themselves. Items could be zoomed, grouped, shared, duplicated, or distributed in any number of ways. If, for example, multiple displays were communicating among one another, the filing envisions that a gesture of a "larger magnitude" might toss an item through intervening displays all the way to the furthest participating display. 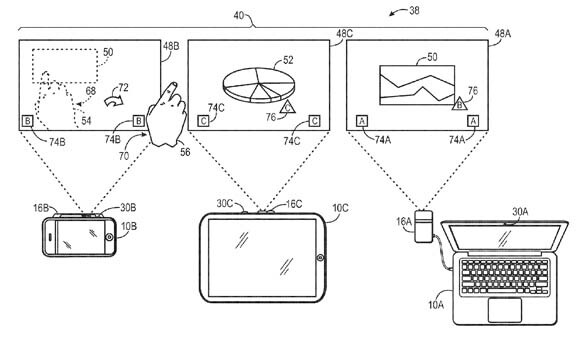 In addition to manipulating items among the projected displays using hand gestures, the filing also envisions a dedicated touchscreen device that could be used to manage the content displayed by each of the participating devices' projectors. The projections could also be combined into a single display. 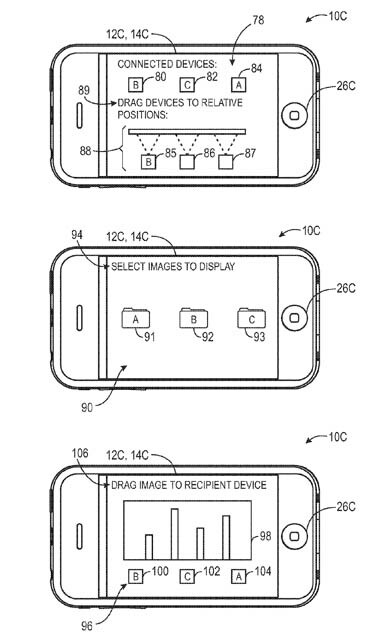 In one example, the filing envisions the devices being able to pinpoint the locations of their peers, and use that location data to seamlessly create a unified display, presumably by varying the display angle and focal length of the devices' projectors. 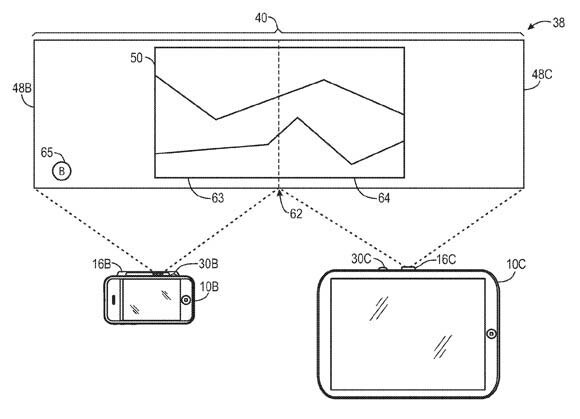 In addition to the projected displays, users would have access to controls on their devices themselves. These on-screen user interfaces could include controls for display positioning and prioritization, soft keyboards for data entry, interfaces for file-system management and item sharing, and the like. There are, of course, multiple hurdles to be, well, hurdled before "Projected display shared workspaces" could become a reality, not the least of which being the low luminance of pico projectors. That said, the filing does describe what might be a quite convenient way for iDevice users to quickly and easily share files. Or we might imagine you and your buddies getting together in your dimly lit man cave and combining your iPhone displays for a big-screen evening of mature edification and enjoyment.